At Seattle Acupuncture & Holistic Health we understand how important it is for you to get back to your peak performance as soon as possible after sustaining an injury. 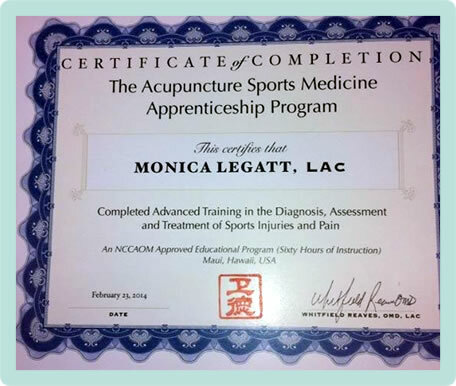 Monica Legatt LAC is an avid athlete and dancer with a special interest in treating sports injuries and chronic pain. She will work to achieve the maximum amount of recovery in the fewest number of treatments for you using her 19+ years of clinical experience practicing acupuncture and Traditional Chinese Medicine. At your first visit Monica will assess your condition and prescribe an acupuncture treatment protocol. Acute or new conditions can typically be resolved within three to six acupuncture treatments. Chronic conditions may require more treatments over time: at each treatment your injury will be re-evaluated to ensure that your recovery is as expedient as possible. Monica is honored to have worked with a wide variety of athletes and artists including major league baseball players, soccer players, cyclists, marathoners, triathletes, Broadway singers & dancers, opera singers, professional ballet dancers, salsa dancers, swimmers, professional musicians, tango dancers, a javelin thrower and a professional curler. She has also worked with many dedicated weight lifters: parents lifting their kids. Monica would enjoy working with you to resolve your injury and get back to doing what you love to do.